Okay, that's a little misleading. 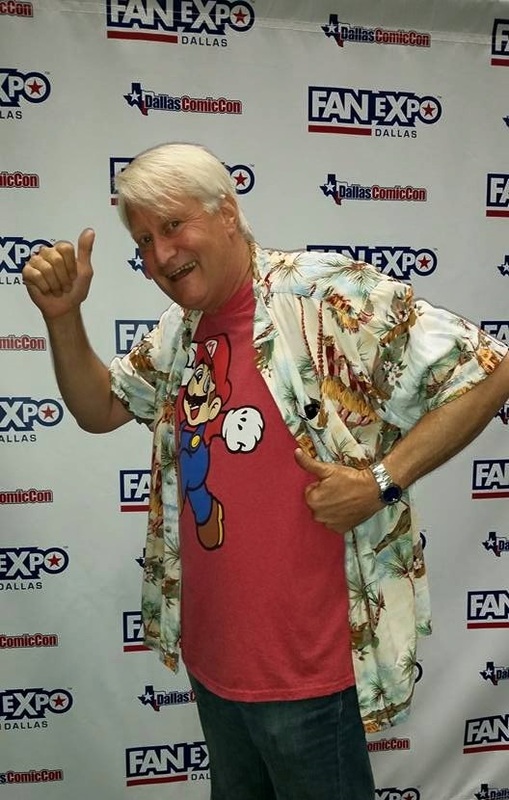 It will take a bit more than two minutes to read this, but I recently had the opportunity to spend two minutes each pulling quotables from gaming and pop culture icons including Charles Martinet, the voice of Nintendo's Mario and Luigi and Drew Powell who plays Butch on TV's "Gotham," at Fan Expo Dallas. While many of the stars were overwhelmed by the city's record-setting rainfall, they were in sunny spirits for the convention and the opportunity to meet their fans one on one. Charles Martinet on deciding how to voice the character of Mario. I went to this audition and I was walking in as the camera man was walking out with the producer. I asked, "Can I read for this?" He looked at his watch, looked at me and says, "Alright come on in, we'll set the camera back up. You're an Italian plumber from Brooklyn in a video game. Make up a voice, make up an accent, start talking. Whenever you stop talking, that'll be your audition." And I thought, Italian plumber from Brooklyn [in a wiseguy voice] "Hey howyadoin? Get outta my face, already." But I thought, well, I'm going to talk with children all day or young people, I want it to be nice and happy. I don't want to be grumpy all day. And I was thinking of a voice that I had done in a Shakespeare play, Gremio in "Taming of the Shrew" and I thought, [in a jolly voice with an Italian accent] "Oh, nice Italian guy. He talks like this." And I thought I could make it younger, and more fun, and dynamic and all of a sudden I heard "action" and I said, [in what is now Mario's voice] "Hello, I'ma Mario! Mama mia! Let's make a pizza pie together!" And I kept thinking surely he's going to say stop but he didn't say stop for 35 minutes--until I heard, "Stop talking. There's no more video tape. We'll be in touch." And that was 24 and a half years ago. Drew Powell on why "Gotham" works for TV. I think with it being kind of an origin story, it opens it up to television in a way that makes it a little more accessible to people. It's hard to do super hero stories for TV, I think, and certainly an iconic one like Batman. And I think Bruno Heller, the creator is really smart because he's figured out the right formula for discovering what it was that created Batman. It's called "Gotham" for a reason. It's about Gotham City--it's about the bad guys like The Penguin, The Joker, and The Riddler and it's about the good guys like James Gordon and Harvey Bullock and Bruce Wayne. So on TV, you have 22 episodes to fill over the course of several years, it's the perfect kind of way to access the comic book world in a way that you can watch it for several episodes without having to pull off some major event every week. It suits itself to television really well. Scott Wilson of "The Walking Dead" on why he loves the convention circuit. I enjoy meeting the fans. If you do a play, you have immediate audience response as soon as the play is over. And if you do a film or television, it's a delayed response. So this puts you in contact with people who enjoyed your work--or not. But usually they enjoy it, or they wouldn't get in front of it. Professional Cosplayers Nicole Marie Jean and Leanna Vamp describe what they do. Leanna: Someone said the other day, "I'm a comic book reenactor." And you know how you see period reenactors and Civil War reenactors who dress costume--we're comic book-esque reenactors. That's an easy way to put it, but basically we dress up in costumes. Nicole Marie Jean: If there's someone who has no idea who we are, I just say I'm a costume designer and artist. It's easier to explain. If I say cosplayer, they say "So, you just dress up in costumes?" And it's more than that. Leanna: I just say I play Halloween all year round. *Note: Both Nicole and Leanna make their costumes by hand, some of which can take 100+ hours. Joshua Ovenshire, David Moss, Matt Sohnki, Wesley Johnson of Smosh Games on their wildly popular YouTube channel. We were working on a much smaller channel at the time, and then that company was acquired by the company that owns Smosh. They just happened to be looking to make a gaming channel at the time, and then they were like, hey these guys already know what's up. So we met to feel each other out, and see if we'd like those guys. We were instantly like a group of friends. The four of us here, we've known each other for 5 or 6 years, now. And that's how we got our success. We're a group of friends who hang together and play video games. People see that, and they're immediately a part of that group... Everyone can related to Lasercorn, the crazy guy who blows everything up. Everyone has one of those in their group.